To beat the summer heat we need to have some thing cool and healthy. Ragi or Finger millet is one among them. We can have it in all seasons, more specially in summer season. Millet flour is available in stores and can be used it instantly. We can buy ragulu and get the flour done in the flour mill also. I have added some barley also to it and get the flour done in the flour mill. The easy way to make java is get the readily available flour from the stores and prepare it. If we need to add any specific ingredients like barly or any nuts, then we have to make the flour on our own way like me. Coming to the point of consumption of it, some people prefer to take this java during breakfast and some like to have it as mid meal. I prefer both ways. Some people sweet porridge and some salted one. I made both at one go. Today I am going to post both recipes. Sweet ragi java is good for infants and kids, salted one is good for others. As it takes longer time to digest it is better to give little portion to infants. We need to check whether they are able to digest it easily or not, then only give it in regular intervals. Boil 2 cups of water in a thick bottomed vessel. Meanwhile mix plain ragi flour in cold water with enough water to make paste. When the water started boiling, mix ragi flour mixture with it. Stir it continuously to prevent forming of lumps. Let this boil for 5 to 8 minutes. 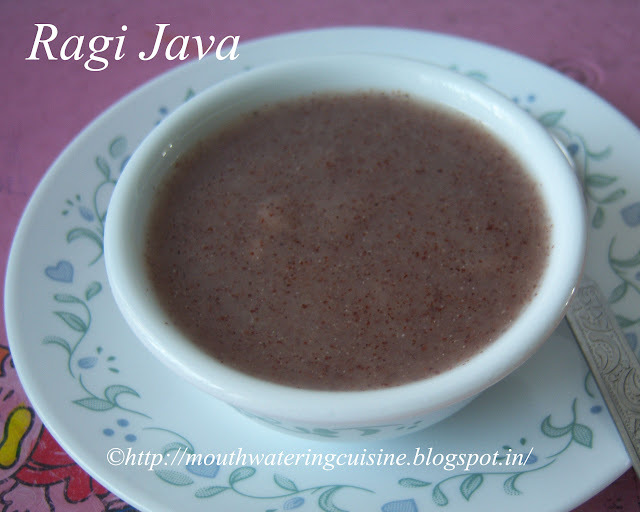 This is the basic ragi java. We can add salt and buttermilk or milk and sugar to it. Take half glass of the above ragi java. Add 1/4 portion of water and 1/4 portion of buttermilk to it. 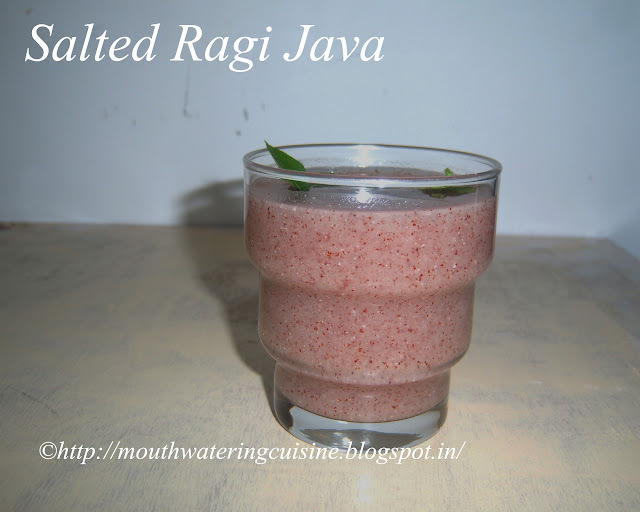 Serve salted ragi java topped with a mint leave. Take some portion of the above ragi java. Add milk and sugar to it and stir well.. 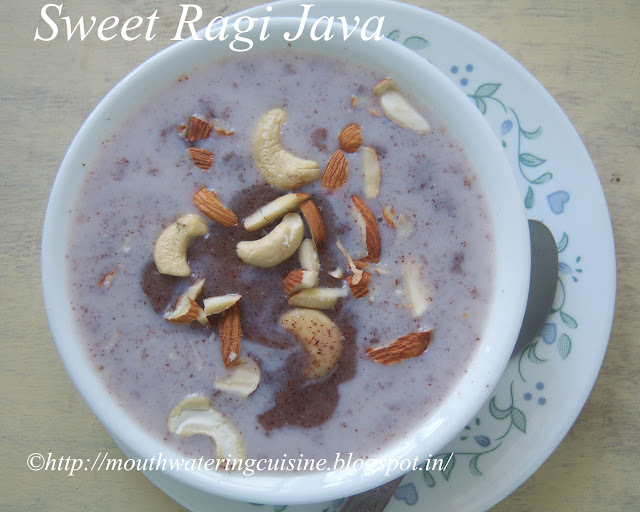 Serve sweet ragi java topped with cashew nuts and almonds.Of course that is optional. For more health drinks click here.Thank you visiting my blog. Hope you liked all my recipes. Any feedback and comments are appreciated.